Growing up surrounded by music, experimental sound artist Eli Keszler was drawn towards the percussive side of things because it seemed worthy partner to his vigour and musical energy. While drums might be home base for Keszler, they certainly don't limit his exploration of sound and the spaces it reflects. Using diagrammatic scores to birth the sound, Keszler finds that the unexpected obstacles and spontaneity of reality shapes his installations in ways he could never predict. 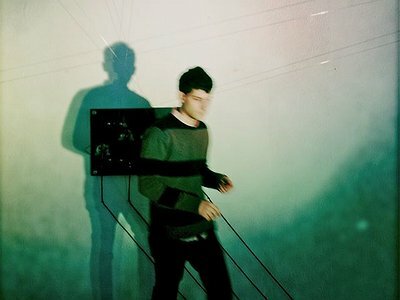 Having created projects on his own label REL, Keszler has also had work released by ESP-Disk and has appeared at Eyebeam in NYC and the Boston Center for the Arts. I don't really know if I could name one – it doesn't really work that way for me. I tend to come up with ideas very quickly and then find objections to them that I then spend a whole lot of time sorting out. Ideas are quick, and its important to keep them like a spark. The distance between an idea and something being brought into the world seems to me to be quite large. My current challenges are connecting the dots between physical objects and musical production. I'm constantly asking myself what does a new musical object look like? How do we make something made out of music that exists in a room? What's the connection between text, language and music? All of these big questions I try to tackle on really specific scales, making the questions smaller, and hopefully through this, revealing some answers. It changes from case to case. I see music in both sound and in visual terms, so often times, the production of an idea comes from a strange place. Frequently, I work with equivalent ideas in drawing and visual terms to think through processes for myself, so maybe a drawing will trigger a score which will trigger music. Or an installation will trigger sound. Sources and routes tend to go around each other and not take a consistent path from left to right. Which to me is very exciting. I don't separate anything, but I don't really think about improvisation in my own work. I feel my way through things whether I write music down or work on more of a verbal idea. When playing with installations, so much of the playing and material is dictated by the physical set up that there really is no need to separate these categories into anything anyway. The improvisation is absorbed as part of composition. When I modify things on a more global level in the environment, through installation, the performance gets changed, this in a way takes the centre of compositional control to a different location. Sound is a reflection of space, and I try to control composition through my installations with whatever is necessary around it to articulate this fact. They are completely intertwined for me. I don't necessarily think this is true for everyone maybe, but for me it absolutely is.